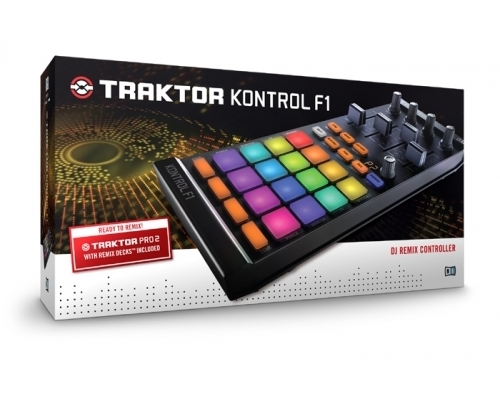 Hands-on control of TRAKTOR�s Remix Decks. Switch between up to 64 tracks, loops and one-shots per deck using a clip-based workflow designed for DJs. TRAKTOR KONTROL F1 is the definitive hardware for controlling the powerful Remix Decks� in TRAKTOR PRO 2 � the flagship DJ software. Finally, you can launch clips in a perfectly intuitive, DJ-centric way � control Remix Decks just like regular track decks, switching between up to 64 tracks, loops and one-shot samples on each deck. With your signature sound at your fingertips, it�s time to blur the line between DJing and live performance. Get started in seconds with over 1.4 GB of premium grade sounds available for download as free Remix Sets. Or you can import your own samples, and even capture loops and sounds live, using the controller�s stylish multi-color pads and ergonomic faders. Expand the creative potential of any TRAKTOR set-up � with or without timecode vinyl � and transform your DJ set into a dynamic live performance. The TRAKTOR KONTROL F1 workflow is rooted in DJ culture. Remix Sets�, made up of your individual loops and sounds, load just like regular tracks in the super-powerful TRAKTOR PRO 2 with Remix Decks�. And your drum loops, bass lines, percussion, vocals and lead sounds are ready for dropping into your performance. Four volume faders and four dedicated filter knobs provide full sonic access to the Remix Deck slots, and to add more flavor, you can route individual slots through TRAKTOR�s FX units. Scratch your live production via Native Scratch timecode control and then mix and fade into a �traditional� track on another deck � fuse classic DJ workflow with the future of DJing. Get started in seconds � just load up the 1.4 GB of premium grade samples from the free Sample Pack and dive into a new level of interaction with your music. The individual instrument stems (drum loops, bass loops, percussion, leads etc), patterns and musical phrases are optimized for instant use - start jamming across musical genres in an almost limitless amount of combinations. Find out more about the sample pack and remix sets here. The hardware and TRAKTOR PRO 2 with Remix Decks� software respond as one. Assign a sample a particular color on the hardware, and see the software instantly follow suit. And with the F1�s slim profile, it fits anywhere. Slot it between your mixer and decks or expand your controller set-up with multiple F1s. General: Monitor with 1024 x 768 screen resolution, USB 2.0, 1 GB free disc space, high-speed internet required DIMENSIONS Dimensions: 4.7" (120 mm) x 2" (52 mm) x 11.5" (294 mm) Weight: 1.6 lb (730 grams) POWER SUPPLY Power Supply via USB 2.0 interface, 5V 500mA bus power. No additional power supply or battery is needed.